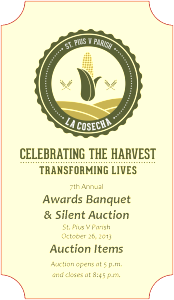 Here is a complete copy of the 2013 St. Pius V Celebrating the Harvest:Transforming Lives Silent Auction book. When our guests place their bids Saturday night, they are making it possible for St. Pius V Parish to serve the many children and families who rely on the welcoming, teaching, and life transforming ministries we provide. Very few seats are still available for Saturday evenings’ banquet, but if you hurry, we are happy to welcome you. Here is a link to the online registration form. You may also call the office at 312.226.6161 to register. See inside! Complete auction list. This entry was posted in Events, Parroquia de San Pió V, St. Pius V Parish by Sister Beth Murphy, OP. Bookmark the permalink.